- Protect your screen from scratch,scuff,damage.A essential thing for your Samsung S8. 1.The adhesive silicone gel is only on the edges of the screen protector, not in the display panel, which is filled with a dot matrix. This was intentionally designed to prohibit any Halo effects. 2.If this screen protector affects your touchscreen sensitivity. Please go to Settings> Advanced Features> Touch Sensitivity. You can adjust your touch screen sensitivity settings there. If there is spot, bubble, or section that doesn't adhere, please gently peel the screen protector off and install it again. Press on the center of the screen before the adhesive progress begins that will make sure the adhesive progress from the center to the other sides, to keep out air. 【Designed for Samsung Galaxy S8】: Specifically designed for Samsung Galaxy S8. 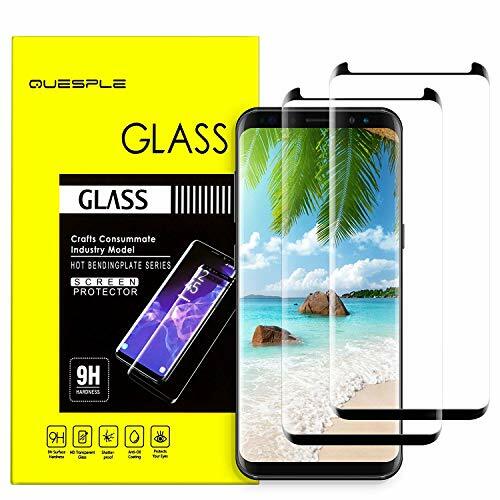 PLEASE NOTICE:Every Screen Protector from QUESPLE Brand seller is backed by our highly regarded "One Year Replacement Warranty and 100% Satisfaction Guarantee" free of charge. 【Anti-Fingerprint】: Easy to wipe the stains and oils from your screen, keep your screen clear and clean. Hydrophobic and Oleophobic screen coating protect your screen against fingerprints, oil, sweat, etc. 【Ultra Thin & Ultra Definition】: 0.3mm thickness is reliable and resilient, and promises full compatibility with touchscreen sensitivity. High definition transparency film with 99% HD provides total clarity and maximum resolution. 【100% Money-Back Guarantee】: Risk-free Warranty Comes with ONE YEAR satisfaction guarantee. Any problems about quality, please feel free to contact us for free replacement or full refund. If you have any questions about this product by QUESPLE, contact us by completing and submitting the form below. If you are looking for a specif part number, please include it with your message.